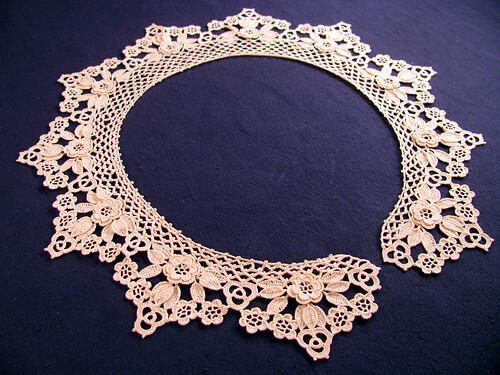 Here is another crochet piece I made that looks like an antique. I used a pattern from the 1932 June issue of “Needlecraft” magazine. It is crocheted in size 100 thread with a size 14 hook. This is a close up of the stitches. I didn’t have the time to block it before I took the photo, so some of the flowers look a little wonky. 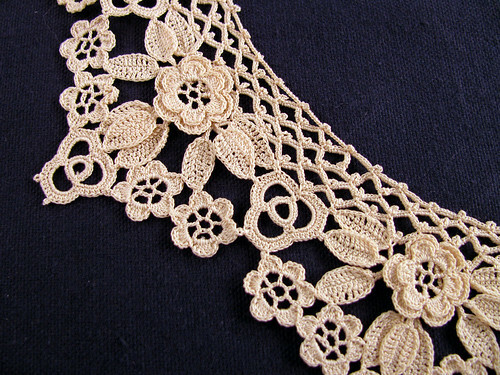 This entry was posted on Wednesday, February 25th, 2009 at 3:00 am and is filed under Crochet and Lace. Tagged: Clothing, Crochet, Lace, Needlework, Thread. You can feed this entry. You can leave a response, or trackback from your own site. Wonky? Its WONDERFUL! This is the kind of handcraft that inspires others. stumbled over here from Ravelry – I’m GardenGirl611.